Yes, the 2017 season for both trout and salmon fishermen and women is now well and truly open. It may be true that, for a few more weeks, the best of it is probably still ahead of us but don't do what I have done all too often in the past - which is to wake up to the opportunities that unfold throughout the year just AFTER they've happened! One trip I've thought about many times - but up until now never organised - is a May or June sea-trout expedition to the mighty Towy, hoping I might be lucky enough to connect with a big early running fish. I'm finally planning to rectify that by putting a date in the diary in the next few days. For me, the anticipation of an expedition like that is a huge part of the enjoyment and I want to get started on it right away, thinking about which rods I will need and, especially, sorting out the right flies for the occasion, invariably topping up with plenty of hot, new patterns developed by the relevant experts, armed with which I cannot fail!! Jessica and I have been busy tidying the shelves, trying desperately to make some room for new patterns by culling a few flies which have fallen out of fashion over the past few years - and catching up with the latest Fulling Mill discontinuations. An interesting question is to what extent it IS simply fashion and the old flies work just as well as they always did, and to what extent the new patterns are a real improvement on what we had before. I suspect that the truth is a bit of both, but if I had to fish for end of season fry feeders with a Jersey Herd instead of one of my beloved Minkie options I would feel very substantially handicapped! What this means for you is that there has been a substantial topping up in the Bin Ends part of our website with some great bargains to be had. We do have customers who watch this area rather closely - and strike fast when they spot an opportunity - so don't delay if you see something you like. It may not hang around! For the salmon fishers amongst you, as well as the discontinued patterns we also have some rather nice and very competitively priced Calvin's Shrimps and Kinermony Killers. These are top quality Pro Range flies which failed our quality inspection on the basis that the colour mix was not the same as our master sample or previous shipments of that pattern - and authenticity (matching our pattern to the one that was originally developed) and consistency (so that the next time you buy that fly it looks the same as it did before) are critical for us. Without two flies side by side the differences are subtle and these flies are a great bargain - the fish may even like them more, who knows?! Talking about flies which might not look quite the same as they did before but this time for a very good reason, please note that some of our patterns, especially the newer ones, do 'evolve' over time. So, occasionally, the fly you buy may look slightly different to what you bought previously, reflecting evolutionary enhancements made to the pattern based on lessons learned through its extended use. The learning for me from this is that bad things can and do sometimes happen and often, as (with hindsight) in this case, there are signs and clues that all is not quite as benign as it was before. We could be talking about weather related issues or 101 other sorts of hazard. On that day the sharks, which had been swimming around us all day, had suddenly become much more agitated in their behaviour. In future I will pay rather more attention to signs like those and act accordingly rather sooner! As far as the Bahamian fishing operation is concerned that lesson has been well and truly learned and, if anyone is interested in finding out more about bonefishing on Exuma, with great accommodation at a very reasonable cost, just give me a call on 01753 883366. A substantial order left our tyers a few days ago and - if all goes according to plan - could be with us before the end of the week. (Cautious language here because delays are far from unheard of!) Quite a few of you should be very happy because that will mean we have stock of our Baby Snakes (aka Snakelets) once again. These have been one of our hottest new patterns ever, in terms of both sales for us and, more importantly, fish in the net for you and, after a recent batch was rejected because the wrong type of hair had been used (Chinchilla instead of Mink) we know we have some rather impatient customers. Others will be delighted to hear that the notorious but deadly Mop Fly will now - by popular demand! - be available in four new colours. More Voodoo Cats too. Watch the website for their arrival. The new season seems to be getting off to a very busy start on many of the big reservoirs. Last week's rod averages for the Anglian Water's fisheries ranged from just over 6 at Rutland and Grafham to more than 9 at Pitsford and Ravensthorpe, whilst Draycote came in at 8.3. 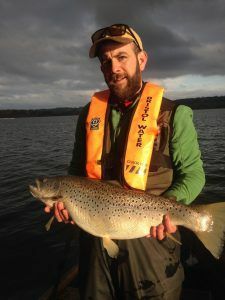 Down at Chew a huge brownie of 13lbs 8ozs was caught on a Minkie and released. What's more fish are being taken on a wide range of fishing approaches, from buzzers to lures, even dries when conditions are right. We all have our tough days at places like these so why don't you blow the cobwebs off your gear and get that rod bent while the fish are being co-operative?! Here's that big Chew brownie. Well done Gareth Roscoe! Many of our customers enjoy fishing smaller stillwaters the length and breadth of the country. We speak with lots of them each week and they're all getting stuck in to plenty of fish right now. These are fisheries that can suffer and become rather challenging as the water warms up and weed growth explodes but in early spring they are at their very best, with plenty of cold, clear water and good stocks of hungry fish. Pick up a Tasty Tadpoles selection, almost guaranteed to deliver action at this time of year and head for the lake! Don't forget that it's new fishing licence time at the end of this month - follow this link to renew online. Don't be tricked into using a parasite link which charges a fee. It's still early days but the new salmon season seems to be getting off to a pretty decent start with steady numbers of fish from the major Scottish rivers being reported most days on FishPal. A party made up of friends of ours who are on the Dee this week reported that they were seeing lots of travelling fish and were hoping for a small fall in water height which might slow them down. I'm not sure they will get that but it was very encouraging to hear news of good numbers of fish. Meanwhile some big fish have been reported from the Wye - not lots of them, but conditions have been somewhat patchy so far and more water is either already arrived or on its way so they will be well spread out in a big, long river. The pattern of stronger spring runs, offsetting the apparent decline in numbers of grilse and later running fish does now seem to be becoming quite well established. Check your waders for leaks, put on an extra fleece, grab the fifteen footer and head for the water! According to one of our customers, who was in the process of investing in 30 of them, the hot fly of the season so far, on the Spey at least, is the Black & Yellow Skullhead! This is how stunning a big spring fish can look. Sadly a year or two ago now - must try harder! Looking for inspiration as you head for the waterside in late March/April? Whether it's early season buzzer fishing, chasing those elusive big spring salmon or the magic of the March Brown, Grannom or Mayfly hatches we have all the flies you need to make the most of every opportunity throughout the year. With very best wishes from us both and Tight Lines!